Dec. 28, 2011 — As we reported on Dec. 24, negotiations between Golden, Jefferson County, Arvada, the Jefferson Parkway Public Highway Authority and the Colorado Department of Transportation (CDOT) ended without an agreement on transportation issues related to the proposed Jefferson Parkway. We greatly appreciate the leadership of Governor John Hickenlooper and CDOT Executive Director Don Hunt, who initiated and energetically supported the negotiations. They attempted to help our region move past two decades of debate to find common ground. We participated in the negotiations in the same spirit. A good agreement would have benefited Golden and the surrounding region. It would have ended Golden’s long-running dispute with Arvada and Jefferson County, allowing us to turn the page on a sometimes acrimonious past and collaborate productively on these and other issues facing our region. It also would have allowed us to bring to a close a long and expensive beltway battle while providing funding for transportation improvements that are needed within our city. But, while we set our sights on an agreement, we never took our eyes off our community’s bottom line. For us, the ultimate test for an agreement was whether it protected Golden from tolling or lane widening being forced through town – in other words, the beltway bisecting Golden that we have consistently opposed. And, despite hundreds of hours spent on constructive negotiations, the balance of provisions was not protective enough to meet the City’s needs. We are certainly disappointed that we were unsuccessful in reaching an agreement. But settling for an agreement that lacked sufficient protections for Golden residents would have been the only failure from which our community couldn’t recover. The entire region would benefit from a good agreement but we won’t settle for a bad one. When it comes to productive discussions with the state and our regional neighbors on these important issues, our door will remain open. We’ve attempted to keep Golden residents apprised of the very latest developments on this issue, communicating candidly to the extent allowed by the ground rules of the negotiations. Moving forward, the 2012 City Council will engage the community in exploring updating the Golden Plan and setting strong priorities for traffic mitigations and improvements in the near future and in the long term. We remain committed to a spirit of openness. 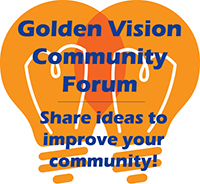 We appreciate and encourage the willingness of Golden residents to be fully engaged in this process.